Someone long ago told me “Nobody loves your baby like you do.” OK, that someone was my friend Bob Pritchett, and when he told me was while he was writing his first book, Fire Someone Today. (here’s the TOC, and note chapter 3). So I’m lovin’ my baby — my new Advent Devotional from Lexham Press, Anticipating His Arrival: A Family Guide through Advent. Have I told you that the prepub price for this sweet devotional — which is really three different advent devotionals in one — is only $2.99? In that spirit, I’ve been mentioning it like crazy on the Twitter and the Facebook. After all, there’s only so much time until Advent (Nov 29 is the first Sunday, people). People need to know about this thing. So I’ve got this guerrilla campaign going. The social media faux-experts say the thing to make it really sing are memes. So here you go. Share these puppies all over the world. Tell your friends. Link back to the prepub page on Logos (just like I do here). It was August, 2009. My daughter was getting to the age where she could start to understand some things about God, Jesus, and Christmas. And our church was sponsoring a church plant, which we joined right away. We needed a new adventure. For some reason — I’m not really sure why — I began writing a short advent devotional for my family so we’d have something easy for the holidays. Nothing long or preachy. Just some daily readings (which I based on the Revised Common Lectionary’s (RCL) weekly readings) and some short questions about the reading. I added some brief answers, too. I’d chatted about it with our pastor, and he thought it was good enough to print some copies for church folk via Lulu. Folks used it and liked it. We used it an liked it in our own family, too. Fastforward to 2012. The RCL is a three year cycle, so I expanded the devotional and added one more year of readings, questions, and answers. We liked that too, and I figured I’d write the third year at some point. Fastforward again to July, 2015. I’d told some folks at work (I work at Faithlife, makers of Logos Bible Software) about it. Some of those folks work for our publishing imprint, Lexham Press. And they thought that an Advent devotional would be a good book for Christmas. So they approached me about finishing it, and I agreed — since I was going to do it anyway. So now there are readings for all three years of Advent covered by the RCL. 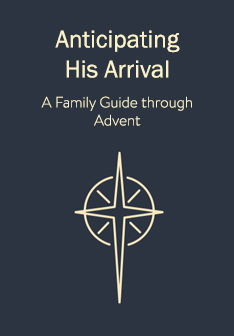 The title of the devotional is Anticipating His Arrival: A Family Guide through Advent. And that’s really what it is: A short Bible reading with 2–4 discussion questions and responses for you to base a family devotional time on during Advent. We’ve read it after dinner. This year I think I’ll try reading it with kids before their bedtimes if busy-ness causes us to miss the dinner reading (hey, it happens). I wanted to share it with y’all because the devotional is on “pre-publication” at Logos right now. And it is probably the cheapest it’ll ever be: $2.99 ($11.99 retail). So subscribe to the prepub, and give it a try. If it does well this year, they may publish it in print for Christmas 2016. This post is already too long. But I hope to post an excerpt from the devotional next week sometime. So be on the lookout.